During the Nara period, before the capital was transferred to Kyoto in Yamashiro province, the province of Yamato was the center of Japanese culture. According to legend, Yamato is said to have been the home of Amakuni (天国) and Amakura (天座), the earliest swordsmiths. After that, the Senjuin smiths Yukinobu (行信) and Shigenobu (重信) are believed to have worked in Yamato at the end of the Heian period. The earliest confirmed time of manufacture for a sword with a signature from this province, however, is the middle of the Kamakura period. The development of the sword smith trade in Yamato was closely linked to the area’s proximity to the capital at Nara. Furthermore, a smith’s prosperity and protection depended on their relationship with the temples with which they were affiliated. From the end of the Heian period, temples in Yamato province acquired vast manors and many branch temples. Accordingly, they strove to arm themselves to guard their rights and property. The five major Yamato schools, the Senjuin (千手院), Tegai (手搔), Taima (当麻), Hosho (保昌), and Shikkake (尻懸) , were groups of swordsmiths who supplied the temples with arms. The Yamato tradition of sword making became known over a wide area through the nationwide organizations of these temples. Mihara (三原), Kanabo (金房) and other schools. In addition, direct exchange seems to have taken place between individual smiths from Yamato province and smiths throughout Kyushu in the early days of the Yamato tradition. The Yamato Tegai (大和手搔) school got its name from the fact that its workshop was built in front of the gate Tengai-mon belonging to the Todaiji Temple in Nara. The first generation Kanenaga (包永) who worked around 1288-1293 is known to be the founder of the Yamato Tegai (大和手搔) school of sword making. The smiths of this school all used the same character. “Kane” (包) in their works. Some of the other smiths were Kanekiyo (包清), Kanetsugu(包次), Kanetoshi (包俊), and Kanemitsu (包光). One of the later smiths, Kaneuji (包氏), left the Tegai tradition to study the Sôshû tradition with Masamune (正宗). He later moved to Mino and founded the new sword making tradition of Mino. Around then he changed the character “Kane” in his mei from (包) to (兼), the one we are familiar with for all succeeding Mino smiths. Tegai Kaneuji (手搔包氏)was also known as Shizu(志津) . 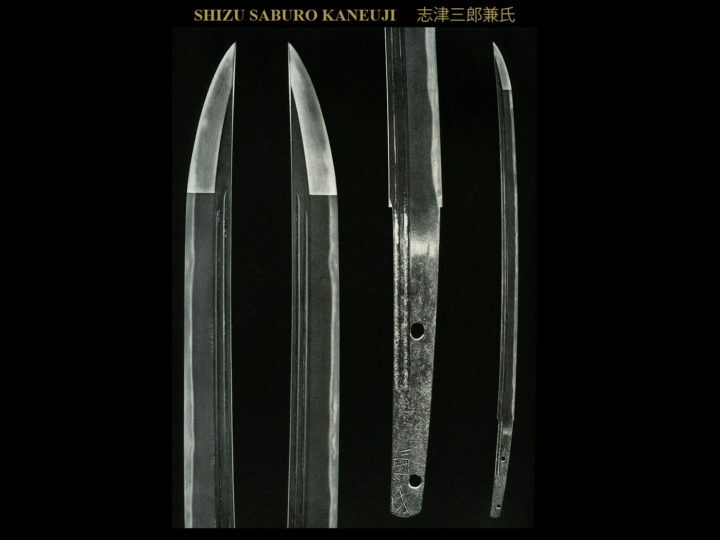 We call swords made by Kaneuji (包氏)while he was living in Nara, Yamato Shizu (大和志津)swords. Of the smiths of this school, the first generation Kanenaga (包永)left a fair number of signed examples of his work. Most have been greatly shortened with the two characters of his name being found at the very bottom of the nakago. There are only two known examples of intact nakago surviving and, unfortunately, one of them has been re-tempered. The works of the first generation Kanenaga (包永)are known to be the best the school produced. The name, Kanenaga (包永), was used by succeeding generations of smiths. 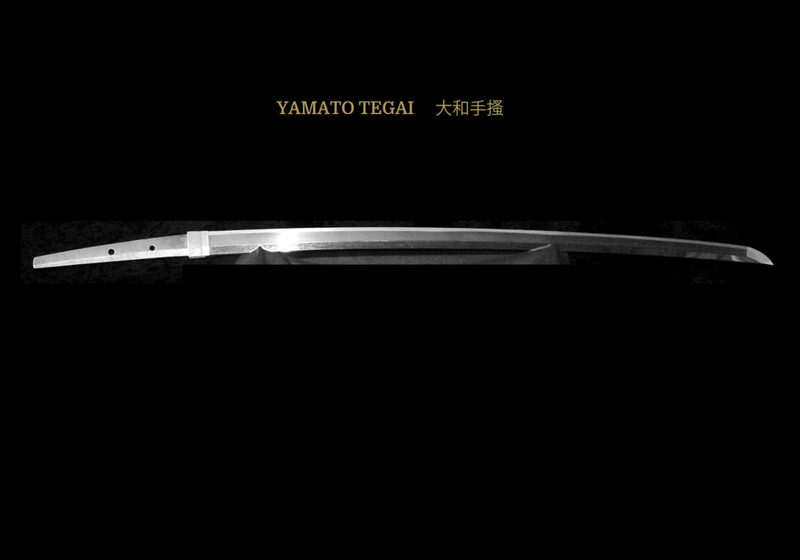 The Yamato Tegai (大和手搔)school continued to produce swords from the Kamakura through the Nanbokuchô eras. At the end of the Nanbokuchô period, the school ceased to be active. However with the start of the Muromachi period, it once again became active and began to prosper. The revived school is called the Sue-Tegai (末手掻)school. We will discuss this later school in a bit. SUGATA: The shape of Tegai school works is what we have come to know as typical Yamato. They are shinogi-zukuri and irori mune. The shinogi is remarkably high with a shinogi-haba. There is a marked curvature with koshi-zori and occasionally some saki-zori. 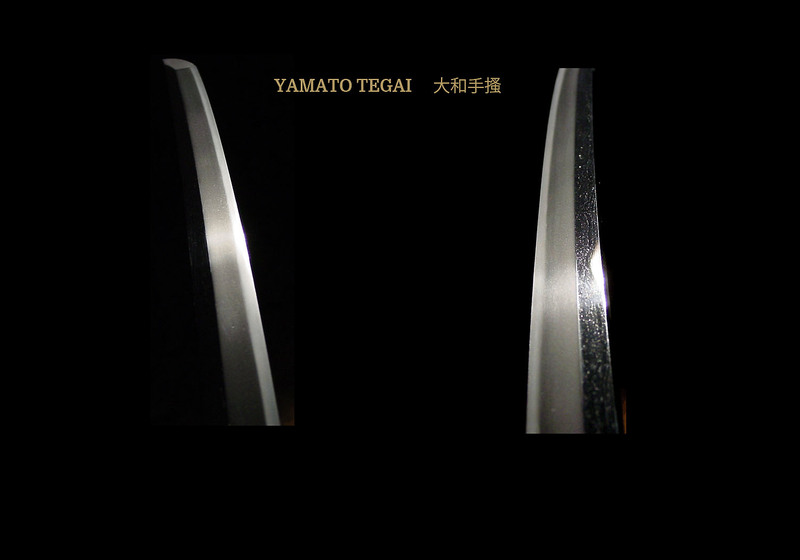 Tanto were not produced by the first two generations of Kanenaga smiths of the Tegai school. Almost all of the tanto produced by the third generation Kanenaga will be hira-zukuri; there are no unokubi tanto. HAMON: While the temper lines of the Tegai school tend to be chu-suguba based with uchinoke and nijuba consisting of nie. Often, particularly in the works of the Shodai Kanenaga, a slight ko-notare and ko-gunome aspect to the hamon will be found. 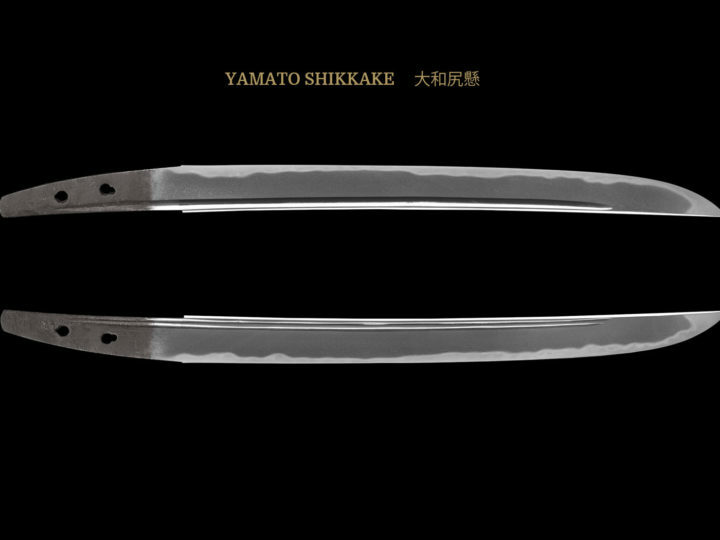 One of the traits of his blades is that often there are significant differences in the shape of the hamon from one side to the other. All will have extremely bright nie present in abundant quantities. Occasionally there is ara ji-nie present. Present in the hamon you will find hotsure, uchinoke, yubashira, inazuma, kinsuji, and other activities. JITETSU: The kitae is most commonly a tight, yet beautiful ko-itame hada. Generally speaking, however, the hada will not be as tight or as beautiful as the Yamashiro school. Also those with a mixture of a hint of masame are common especially in the later generations. Kanenaga is generally known for the crisp and clear nature of his jigane that tends to be comparatively blackish. The pronounced display of nie grains in the ji is another characteristic of this school. BÔSHI: Strong nie and yakizume are the most common traits found in this school’s bôshi. Some have kaeri and are completely hakkake. The kaeri when present is short. They are generally chu-kissaki. NAKAGO: The nakago of tachi will be long while in tanto they appear to be a bit stubby. Most of the surviving works are o-suriage with the original nakago lost; the couple of surviving ubu examples have a kuirjiri tip, round mune, and the yasurime done in takanoha (hawk feathers). MEI: Generally, and perhaps without exception, the signatures of the smiths of this school are two character (ni-ji mei). The first character of the name will be “Kane”. Representative smiths who continued the Tegai tradition in the Muromachi period were Kaneshige (包重), Kaneyuki(包行), Kanekiyo (包清), Kanetoshi(包俊), Kanezane(包真), Kanemune(包宗), Kaneiye(包家), and Kanesada(包貞). Generally more tanto than tachi or katana are extant today by all of these smiths, and among them even some with remarkable deki. SUGATA: The shape of Sue Tegai (末手掻) works is what we have come to know as typical Yamato for the period. They are shinogi-zukuri and irori mune. The shinogi is high with a wide shinogi-haba. 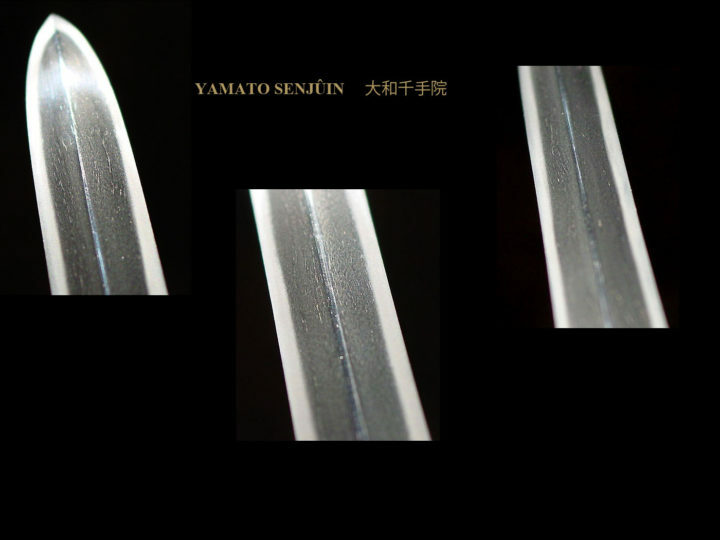 Shinogi-zukuri and shobu-zukuri shapes are found in wakizashi. In tanto, there is a narrow mihaba, a shortened nagasa, and a slightly rounded fukura. The sugata looks sharp. The kasane is thick, in spite of narrow mihaba. HAMON: The temper line is narrow and tight. The hamon consists of nioi with some nie, but with little activity. O-midare, is seen on occasion. JITETSU: The fine ko-mokume ji-hada is mixed with masame– hada. There is little or no ji-nie present. The jigane is a bit hard and whitish in color. 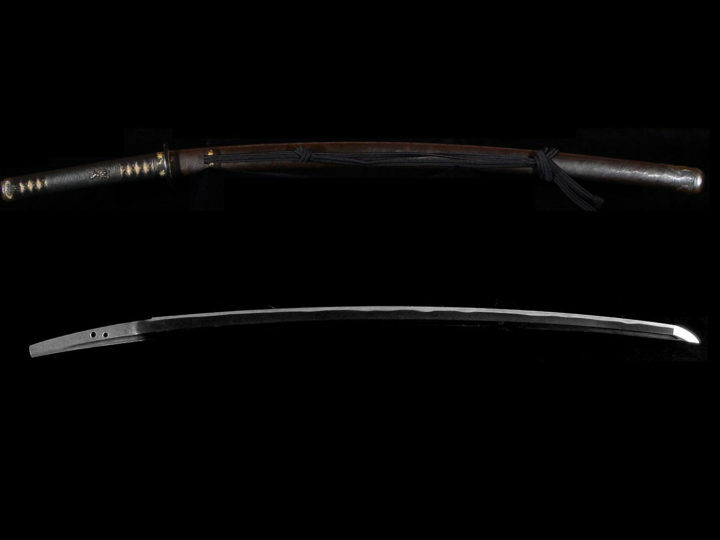 BÔSHI: Yakizume becomes rare compared with older Tegai blades. The standard ko-maru bôshi is most common. The kaeri becomes longer than in older Tegai blades. NAKAGO: While, most of the surviving works are o-suriage with the original nakago lost, there are surviving examples with a mei, but they are rare.